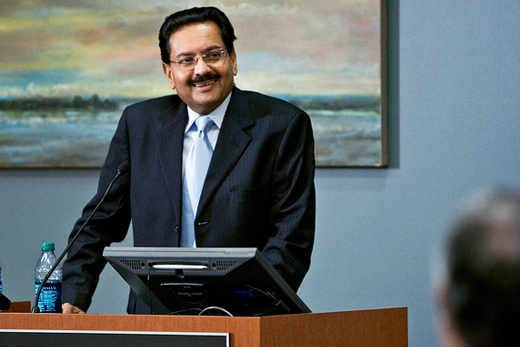 Ajit Kumar, consul general of India in Atlanta, kicks off the series with a lecture on India’s foreign policy Thursday, Nov. 8. In light of the impending withdrawal of most U.S. combat troops from Afghanistan in 2014, Emory University’s Halle Institute for Global Learning will explore the regional and national ramifications of this transition on India, Pakistan, Afghanistan and the United States in a special series of events next month. The series features three free, public luncheon lectures by Ajit Kumar, consul general of India in Atlanta; Faqir Syed Asif Hussain, consul general of Pakistan in New York; and Tim Lenderking, director of the Office of Pakistan Affairs at the U.S. State Department. Afghan Ambassador to the U.S. Eklil Hakimi will also visit Atlanta Tuesday, Nov. 27 to speak with Emory students and faculty about U.S.-Afghan relations. Kumar will kick off the series with a lecture on India’s foreign policy Thursday, Nov. 8 at 1 p.m. in the Dolive Suite, Goizueta Business School, 1300 Clifton Road. Kumar and Indian Ambassador to the U.S. Nirupama Rao inaugurated the new Indian consulate general in Atlanta on Oct. 22. Register to attend Kumar’s lecture. Hussain will discuss U.S.-Pakistan relations, as well as Pakistan’s future relations with Afghanistan, India and China Tuesday, Nov. 13 at 1 p.m. in the Cox Hall Ballroom, 569 Asbury Circle. Before arriving in New York, Hussain served as the minister for political affairs at the Embassy of Pakistan in Washington, D.C. Register to attend Hussain’s lecture. Lenderking will give a talk on the impact of troop withdrawal on U.S. relations with Pakistan and Afghanistan Thursday, Nov. 15 at 1 p.m. in Room G575, Emory University School of Law, 1301 Clifton Road. Prior to joining the Pakistan office, Lenderking completed two tours in Baghdad, first as the senior democracy advisor at the U.S. embassy, then as the policy adviser to Lt. Gen. Charles Jacoby at Camp Victory. Register to attend Lenderking’s lecture.